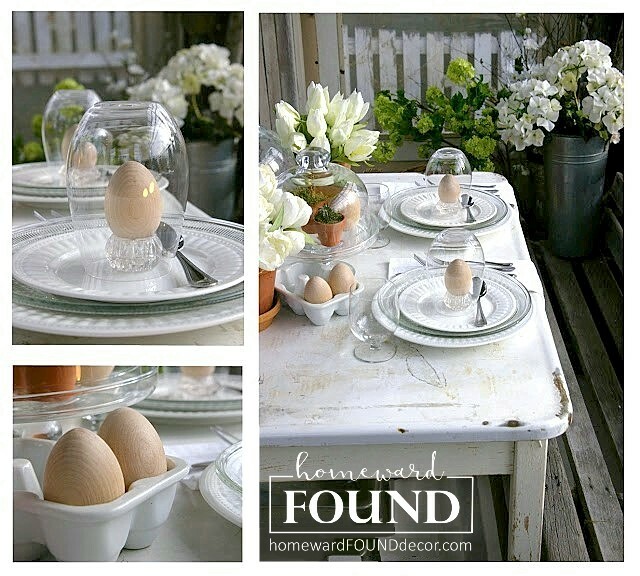 i thought you'd like to see a few more ideas for using it in your Holiday decor! above, a vintage glass pie plate is filled with sno-balls made from the magic SnoWonder faux snow. yes, they hold their shape like that - and are still wet and 'cold'! 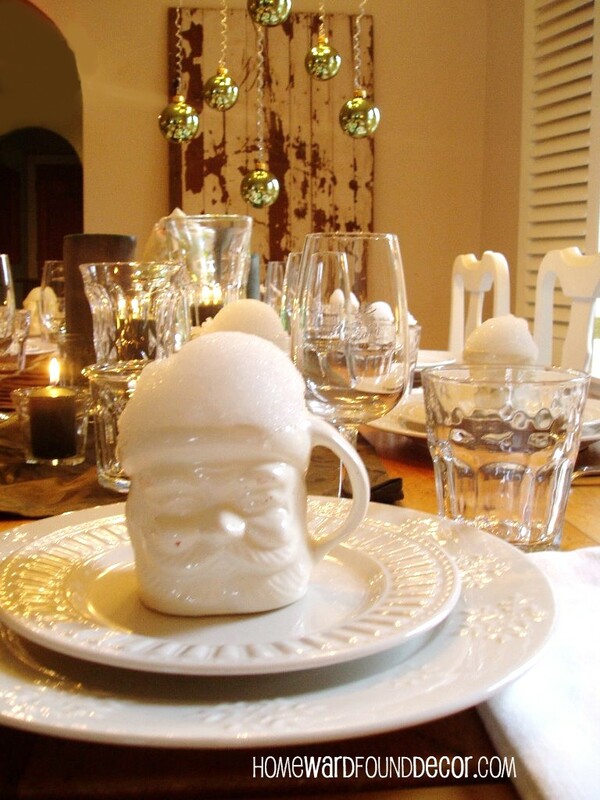 what else can you do with SnoWonder faux snow? i like the simplicity of the sage green ornaments hanging from the chandelier on spiraled pipe cleaners, too. btw, my spiffy white Santa mugs started out just like the ones you see in antique shops - red and white. i just soaked them in hot water and soap, then used an old credit card to scrape off the softened red paint. it was an easy fix to stay true to my own style! i am a big proponent of using ornaments all over the place - not just on the tree. [when the tree is full, you gotta' stop. and various ornaments nestled into the snow. 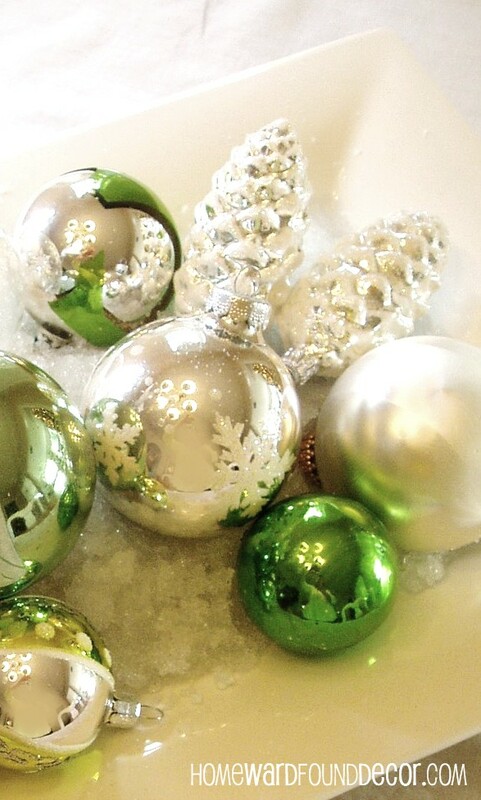 see the white, chartreuse, and silver bell in the photo? it has no back. really. it was broken when i bought it. and no one will ever see the back and know that it is not a perfect vintage treasure. 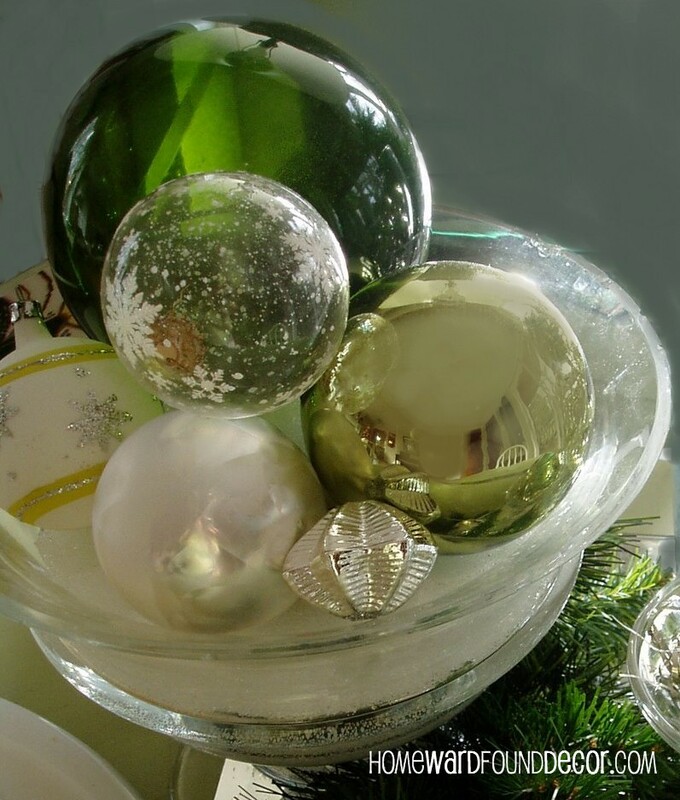 a clear glass footed bowl also plays host to SnoWonder and some ornaments. mixing up the ornament sizes, patterns, and shapes makes for an interesting display. is invigorated by the shades of green: evergreen, celadon, sage, and chartreuse. is still able to serve up a healthy serving of ornaments on a bed of fresh Sno! it carried into other ways to bring wintery delights inside. 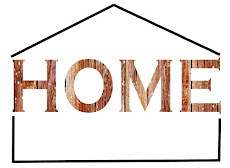 in a 900 square foot Cottage, keeping it spacious was important! i used a fake tree, with mini white lights and strands of large white light bulbs. sadly, the large bulbs ended up BLINDING anyone who looked at the tree at night! so I took some polyfil stuffing and placed a 'pouffe' of it as 'snow' over each bulb to soften the brightness. they were gift tags that i bought at a paper supply store on clearance! 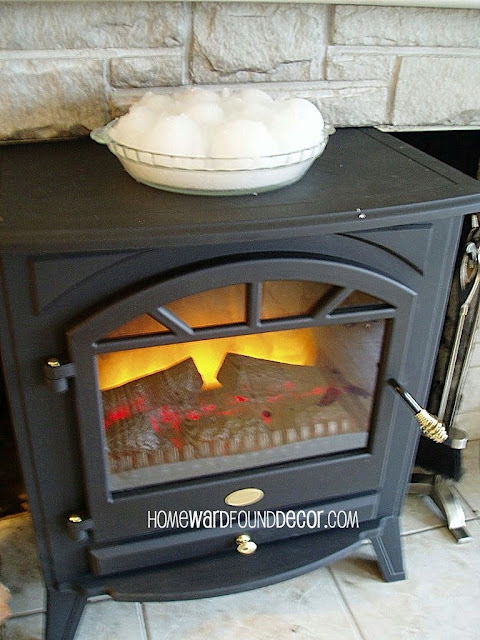 i love doing this - it's so easy, and keeps ornaments from breaking! some pine boughs and white mini lights finish it off. from vintage pipe cleaners and silver resin mini-ornaments. and some dripping silver glass garland. i like them a lot better than real poinsettias, but those would look lovely here, too. especially the 'Limelight' variety with bright lime green bracts. just a fresh idea, the color green, and Snow! Wow that is cool stuff isn't it! I sent some of this to our family in Florida so they could enjoy a bit of snow for the holidays :-). We don't need any of that here we get plenty of it!Beautiful tablescape and tree! it suits me perfectly. I love the style you choose and am amazed at how you created it. 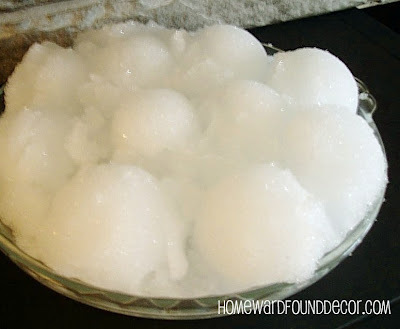 I am so looking forward to my small packet of snow and now I have some ideas as to how to use it. I'll make sure to show you and tell in my post about winning it and pointing folks here to see your post. thanks for all the beautiful inspiration. 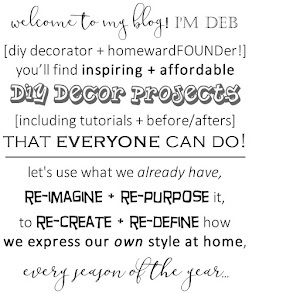 Deb, I think this is my favorite post to date! So FULL of wonderful ideas that anyone can follow.